The county has announced it has ceased all work on Disaster Relief (DR) project 4199 near Carlsbad in compliance with an order from the Department of Homeland Security and Emergency Management. 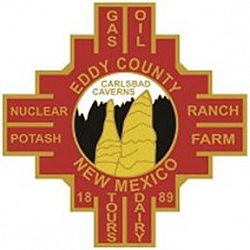 Eddy County received a letter Friday from DHS stating “all Eddy County DR 4199 work must immediately cease”. In a regular meeting, Tuesday, the Eddy County Board of Commissioners directed staff to comply with the cease order for all work related to DR 4199 at the close of business that day. The BOCC also directed staff to close Whites City Road (County Road 724) effective Nov. 13, until such time as work is allowed to resume. The closure is necessary to protect the work-in-progress. Whites City Road will be closed from U.S. 62/180 to U.S. 285 on Tuesday, Nov. 13. The Oct. 29, 2014, federal declaration DR 4199 declared eight counties eligible for federal aid under the FEMA Public Assistance program due to heavy rain and flooding. Those counties include Colfax, Eddy, Lincoln, Lea, Otero, Santa Fe, San Miguel and Sierra. To date, Eddy County has invested more than $20 million in construction funds to recover from the 2014 disaster event that destroyed 110 miles of county roads, bridges and low-water crossings. In order to not lose the monies invested, Eddy County is forced to close out all traffic on the nearly completed Whites City Road until allowed to continue construction. Currently, more than 50 percent of the affected roads have been restored, including Dillahunty, Harroun, John D Forehand, Hobble, Fisherman’s Lane, Cross Buck, Roadrunner, Rock Daisy, Gypsum, Sidekick, and Rawhide Crossing. For more information on the order and closure, contact the County Manager’s Office at 575-887-9511.